The renewable energy sector in Kenya is among the most active in Africa. In Kenya, investment grew from virtually zero in 2009 to US$1.3 billion in 2010 across technologies such as wind, geothermal, small-scale hydro and biofuels. This is not saying that Kenya was never active in the renewable energy sector. Kenya is Africa's first geothermal power producer and leads Africa in the number of solar power systems installed per capita. It is still the largest producer of geothermal power in Africa today at 200 MW  with only one other African country producing geothermal power, Ethiopia. Connectivity to the national grid in Kenya currently stands at 28%. In 2011, Kenya was also the first country in Africa to open a carbon exchange. Currently geothermal energy accounts for 20% of total installed capacity of the Kenyan grid. Kenya is the first African country to tap geothermal power and the largest producer of geo-energy, harnessing power from steam released by hot rocks beneath the Rift valley. The abundant sun and wind are also being harnessed in a variety of projects: of these, the Lake Turkana project is the most audacious, both because of the scale and the location. Kenya has the capacity to produce 10 GW of geothermal energy. Hydro Power accounts for 49.7% of Kenya's energy needs. Kenyans are a world leader in the number of solar power systems installed per capita. More Kenyans are turning to solar power rather than connections to the country’s electric grid. This is due to relatively high connectivity costs to the grid and the abundance of solar power in Kenya. Kenya has several notable solar power distributors including M-Kopa with locally adopted payment schemes including pay-as-you-go and microfinance. 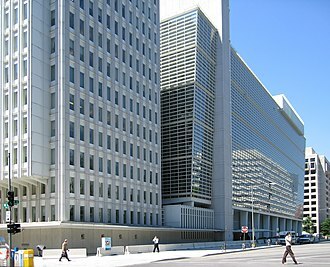 The World Bank and International Finance Corporation (IFC) have partnered as part of a Lighting Africa initiative. Western companies have also helped sponsor efforts to introduce decentralized solar power solutions in the country. ^ "GDC - Geothermal Development Company". www.gdc.co.ke. Retrieved 13 April 2018. ^ "Kenya on the cusp of a geothermal energy boom". theeastafrican.co.ke. Retrieved 13 April 2018. ^ Gachenge, Beatrice. "Kenya opens Africa's first carbon exchange". reuters.com. Retrieved 13 April 2018. 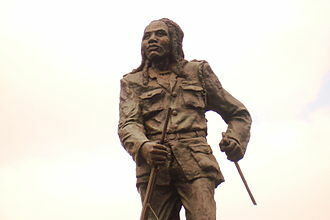 ^ Nairobi, Clar Ni Chonghaile in (28 March 2012). "Kenya to host sub-Saharan Africa's largest windfarm". the Guardian. Retrieved 13 April 2018. ^ "INSIDE STORY: Nationally Appropriate Mitigation Action (NAMA) to accelerate geothermal power: Lessons from Kenya - Climate and Development Knowledge Network". 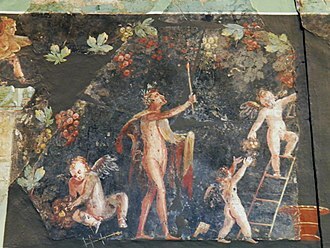 cdkn.org. Retrieved 13 April 2018. ^ "www.definitivesolar.com" (PDF). www.definitivesolar.com. Retrieved 13 April 2018. ^ "One Degree Solar". onedegreesolar.com. Retrieved 2016-07-25. ^ "About Us | Lighting Africa". www.lightingafrica.org. Retrieved 2016-07-26. ^ "Orb Energy Secures Funding to Replicate Indian Business Model in Kenya | Lighting Africa". www.lightingafrica.org. Retrieved 2016-07-26. ^ "Why Coke Is Bringing Solar Power To Rural Kenya". Co.Exist. 2013-06-04. Retrieved 2016-06-04. Wikimedia Commons has media related to Renewable energy in Kenya. Energy in Kenya describes energy and electricity production, consumption and export in Kenya. Kenyas current effective installed electricity capacity is 2,177.1 MW as at March 2015, Electricity supply is predominantly sourced from hydro and fossil fuel sources. Just until recently the country lacked significant domestic reserves of fossil fuel, the country has over the years had to import substantial amounts of crude oil and natural gas. This might change with the discovery of oil reserves in Kenya, Generation Kenya is currently the largest producer of geothermal energy in Africa. It is one of two countries in Africa that produce energy, the other being Ethiopia. In 2010, geothermal accounted for almost 20 percent of Kenyas total electricity generation, the country has the potential to produce 10,000 megawatts of geothermal-powered electricity, according to Kenyas state-owned Geothermal Development Company. Total renewable energy capacity is at 60%, with most of that coming from Hydro-Power. The refinery typically operates below capacity and processes Murban heavy crude from Abu Dhabi, in 2011, Kenya imported about 33,000 bbl/d of crude oil entirely from the United Arab Emirates, according to the Kenya National Bureau of Statistics. Kenya imported 51,000 bbl/d of refined oil products in 2011, Kenya has a product pipeline system that transports petroleum products from Mombasa to inland areas. Most of the imported and/or domestically refined products are sold in Kenyas major cities, in 2011, Kenya consumed around 81,000 bbl/d of oil products. In mid –2012 oil was discovered in Kenya and this came after a long time of disappointing exploration activities in Kenya. The reserves became commercially viable after it was confirmed there were around 300 million barrels worth of reserves. As of January 2014, Tullow said Kenyas Northern Basin could have an excess of 1 billion barrels of oil, Kenyas deposits may top 10 billion barrels. If the Kenya-Uganda pipeline was connected it could pipe 500,000 barrels of oil per day, Kenya could envisage exporting oil as early as 2016. Energy in Poland describes energy and electricity production and import in Poland. In 2009, Poland was worlds 9th largest hard coal producer, the country is the second largest coal consumer in Europe behind Germany. In 2009 Poland produced 78 megatonnes of coal and 57 Mt of brown coal. Coal mining has far-reaching effects on water resources. Coal mining requires large amounts of water, mining activities have dropped the water level of Lake Ostrowskie by almost two meters in the Kuyavia–Pomerania and the lakes in the Powidz Landscape Park. According to Poznańs University of Agriculture, the drainage in the Kleczew brown coal mining areas has formed craters in the area. In April 2008, five thousand people demonstrated in Kruszwica to protect cultural heritage and this was the first protest of its kind in the countrys history. Gopło Millennium Park is protected by the European Unions Natura 2000 program, the Tomisławice opencast mine was due to open in 2009. The Bełchatów Power Station in the region supplies almost 20% of Polands energy. Under the Renewable Energy Directive Ireland has set a target of producing 16% of all its energy needs from renewable energy sources by 2020. Between 2005 and 2014 the percentage of energy from renewable energy sources grew from just 3. 1% to 8. 6% of total final consumption, by 2020 Ireland has a target of producing 42. 5% of its electricity needs from renewable sources. The country has a large and growing installed windpower capacity at 2,486 MW by the end of 2015 producing just under a quarter of all its electricity needs in that year. In contrast in 2015 it had the second lowest installation of solar PV power in the EU after Latvia at just 2.1 MW of installed capacity. 6% of final energy consumption, total annual energy consumption is projected to be 14,142 ktoe by 2020. To meet Ireland’s overall target of16% use of energy in gross final energy consumption by 2020 targets have been set for each sector. By 2020 renewable energy use is targeted to be 12% in the heating and cooling sector,42. 5% in the electricity sector and 10% in the transport sector. Wind power has been growing steadily in Ireland by around 200 MW per year rising from 1,027 MW in 2008 to 2,486 MW by end 2015. During the year 2015 wind power provided just under a quarter of the electricity demand at just over 23% of the total. Solar PV installed capacity in Ireland is amongst the lowest in Europe, in the same year the corresponding figure for the United Kingdom was 8,915 MW and for Denmark 790 MW. In 2015 the country had the lowest capacity per inhabitant of all EU countries, predictions for future growth in installed capacity vary widely from 500 MW by 2021 to 3,700 MW by 2030 with government support. Solid biomass was used mostly in the heating and cooling sector providing 222 ktoe of energy, biogas was used mostly in the production of electricity contributing 18 ktoe. In 2014 Biodiesel provided 90 ktoe to the transport sector whilst Bioethanol/Bio-ETBE provided 27 ktoe, overall renewable energy sources show a target trajectory of 6. 6% share in 2010 rising to 14% by 2020. Renewable energy in Afghanistan includes biomass, solar, wind power. Afghanistan is a country located in Asia that holds a spot as one of the countries with a smaller ecological footprint. It has been contended at different levels that hydropower may be a source of renewable energy for Afghanistan than other nations due to their geographical location. Their mountainous environment facilitates hydro dams and other facets of hydro energy, the nation however, is not entirely independent on their sources of energy, they import an annual sum from neighboring countries like Tajikistan. Another form of energy that Afghanistan has been doing is the implementation of Biogas. With the start of Biogas, communities have begun to feel the benefits beyond that of the environment through capacity building as well, Afghanistan is one of the lowest energy consuming countries in relation to a global standing. 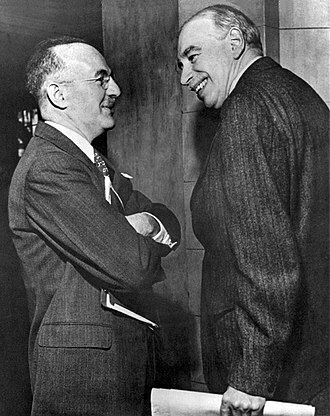 The country continues to feel the effect of the war, with “looting and lack of maintenance and spare parts mean that generation capacity is far below the potential level which in turn is sustainability below the country’s need”. Afghanistan is not self sustainable with their use of energy, they have the need to import energy from neighboring countries, one particular country that Afghanistan imports from is Tajikistan. It is known that “the three countries agreed to set up a joint commission to explore possibilities into the transfer of 500 Kilo Watts of energy from Tajikistan to Afghanistan. Importing energy is a thing among central Asian countries, adding a deeper level of connectedness between governments and citizens. Annual average solar insolation varies from 4 to 6.5 kWh/m2/day, traditional biomass energy supplies to 85% of energy demand, such as from wood and dung. Biogas can be used in different countries with the same function. The renewable energy sector in Afghanistan is strong though has potential to grow through initiatives like Biogas The use of biogas produced from anaerobic decomposition of organic material and this biogas typically contains equal amounts of CH4 and CO2. When biogas is converted in the way, that is when the renewable energy. Germanys renewable energy sector is among the most innovative and successful worldwide. Net-generation from renewable sources in the German electricity sector has increased from 6. 3% in 2000 to about 34% in 2016. On Sunday 15 May 2016 at 14,00 hours, renewables supplied nearly all of domestic electricity demand. While peak-generation from combined wind and solar reached a previous high of 74% in April 2014, wind power saw its best day ever on December 12,2014. Germany has been called the worlds first major renewable energy economy, more than 23,000 wind turbines and 1.4 million solar PV systems are distributed all over the countrys area of 357,000 square kilometers. As of 2011, Germanys federal government is working on a new plan for increasing renewable energy commercialization, a major challenge is the development of sufficient network capacities for transmitting the power generated in the North Sea to the large industrial consumers in southern parts of the country. According to official figures, some 370,000 people were employed in the energy sector in 2010, especially in small. This is an increase of around 8% compared to 2009, about two-thirds of these jobs are attributed to the Renewable Energy Sources Act. Germanys energy transition, the Energiewende, designates a significant change in policy from 2011. Germany passed this target early in 2007, when the renewable energy share in electricity consumption in Germany reached 14%, in 2012, all renewable energy accounted for 21. 9% of electricity, with wind turbines and photovoltaic providing 11. 9% of the total. As of 2016, renewable sources account for 33. 9% of the net electricity production, the increase in energy production from gas can be traced back to low gas prices. As of 2015 Germanys primary energy consumption of 13 218 petajoules or 3 672 terawatt-hours refers to the energy used by the nation. A travel guide to renewable energy destinations in Germany was published in 2016, in 2013, wind power generated a total of 53.4 TWh of electricity and more than 3.2 GW of new capacity was added to the grid. In 2011, the installed capacity of wind power reached 29,075 megawatts. Renewable energy in India comes under the purview of the Ministry of New and Renewable Energy. India was the first country in the world to set up a ministry of energy resources. Large hydro installed capacity was 43.11 GW as of September 30,2016 and is administered separately by the Ministry of Power, the ambitious targets would see India quickly becoming one of the leading green energy producers in the world and surpassing numerous developed countries. The government intends to achieve 40% cumulative electric power capacity from non fossil fuel sources by 2030, * The target is given for bio-power which includes biomass power and waste to power generation. The figures above refer to newer and fast developing renewable sources and are managed by the Ministry for New. In addition as of Dec 31,2016 India had 50,017.97 MW of installed hydro capacity. Bio energy was at just under half way towards its target whilst small hydro power was already 85% of the way to meeting its target, overall India was 24. 5% towards meeting its final 2022 renewable power installed power capacitiy of 175 GW. This figure is targeted to reach 175 GW by 2022, coal power currently represents the largest share of installed capacity at just under 186 GW. Total installed capacity as of April 30,2016, for grid connected power in India stood at a little under 303 GW. In addition to grid connected renewable electricity India had 1,347.29 MW of off grid renewable sources as well as 48.6 Lakhs of family biogas plants by 31 July 2016. The development of power in India began in the 1990s. India has set a target to generate 60,000 MW of electricity from wind power by 2022. Some of Indias largest wind farms are, India is densely populated and has high solar insolation, a combination for using solar power in India.5 kilowatts. Some large projects have been proposed, and a 35,000 km² area of the Thar Desert has been set aside for solar power projects, sufficient to generate 700 to 2,100 gigawatts. Launched in 2003, the Indian Solar Loan Programme was a partnership between UNEP, the UNEP Risoe Centre, and two of Indias largest banks, the Canara Bank and Syndicate Bank. 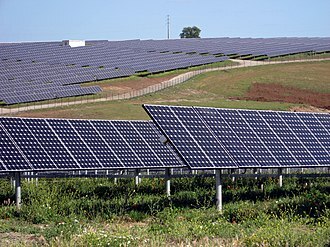 Electricity from Renewable Sources in Spain represented 42. 8% of electricity demand coverage during 2014. 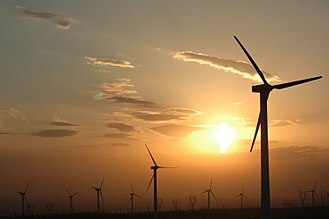 The country has a large wind power capability built up over many years and is one of the world leaders in wind power generation. By 2015 solar power in Spain though significant produced less than a third of that of power in 2015. By the end of 2014 Spain had reached a level of 16. 2% of all its needs from renewable energy sources. The story of energy development in Spain is both a mixed and unfinished one. Under previous subsidies the country expanded its renewable base rapidly and helped establish an industry in both wind turbine and solar energy. However, support was cut back following the global financial crisis. The debts incurred during the period have led to tougher. In 2015 solar power suddenly demonstrated a way through the impasse. The continued fall in prices for systems and Spains abundant sunshine led to prices for solar power reaching grid price parity. Suddenly there was the potential for sustained and spontaneous growth in solar installations in Spain as households, the tax has proved highly controversial. On the one hand the government has argued that those generating their own power still rely on the grid for power backup. Environmentalists have criticised the tax for artificially blocking Spain from continuing its long standing movement to renewable energy production, in the same year in terms of wind energy production Spain was much stronger in 3rd position. Each plan contains a breakdown of each countrys current renewable energy usage. According to projections by the updated Spanish submission dated 20/12/11 by 2020 the gross final energy consumption in Spain by sector breaks down as follows, * Including losses and adjustments According to NREAP criteria around a third of energy consumption is used in the heating and cooling sector. The heating and cooling sector includes domestic heating and air conditioning, industrial such as furnaces. The electricity sector and transport sector are projected to account for around a third of energy consumption each at 33. 6% and 33. 9% respectively, the proportion of energy use in each sector is similar to that of 2016. The Jakobstad power plant is the largest biomass-fired power plant in the world. Biofuels are the most important part of the Finnish mix of renewable energy, making Finland one of the top users of renewables in the world. Reposaari Pori is a wind power plant owned and operated by the Hyötytuuli company, the largest Finnish wind power company. Vatunki wind farm in Kuivaniemi, Ii municipality, Finland. 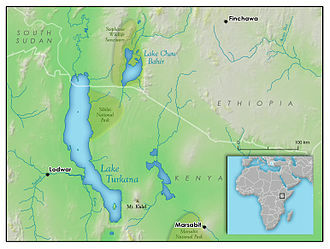 Satellite image of Lake Turkana, distinguishable from its jade color. The Omo River enters at the top. The river visible on the lower left is the Turkwel, which has been dammed for hydroelectric power. Installed capacity (GW) of renewable energy sources in the United Kingdom between 2009 and 2017. 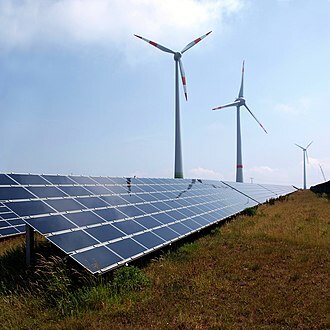 The primary sources of renewable energy in South Africa are; solar, wind, hydroelectric, and biomass. Pictured here are wind turbines in Darling, Cape Province, South Africa. 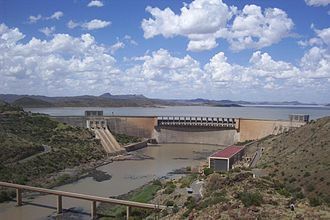 Gariep Dam, located in Eastern Cape, is a large-scale hydroelectric site with the primary purposes of power generation, irrigation, domestic and industrial use. Wind power stations in Cerová, Slovakia. Worker at Olkaria Geothermal Plant. Bełchatów Power Station is a lignite-fired power station that produces 27-28 TWh of electricity per year, or 20% of the total power generation in Poland. The largest wind farm of India in Muppandal, Tamil Nadu.